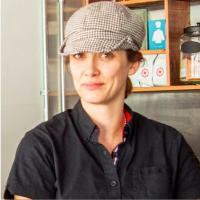 Carrying with her an unapologetic love for local farmers and their produce, as well as an unbridled enthusiasm for good food done exceptionally well, chef Sandra Cordero has taken great joy in creating Gasolina Cafe, a Spanish influenced breakfast and lunch restaurant that opened it’s doors in Woodland Hills in 2015. Bringing a ton of flavor and a focused passion to every dish she creates, she’s had the pleasure of seeing her restaurant serve as a second home to many of its regulars. Half Dutch, half Spanish and raised between the always exciting city center of Amsterdam and the rural, closely knit villages of the Galicia region in Spain, she consistently puts the story of who she is onto every plate that leaves her kitchen. Sandra is a season 1 Food Network Cutthroat Kitchen Champion, and has made appearances on Vista LA & Eye on LA on ABC 7. She has had the pleasure of Jonathan Gold calling herpatatas bravas“home fries from heaven” in the LA times. Gasolina Cafe will open it’s second location in Spring 2019 in Westlake Village, CA where she resides with her husband John & daughter Matilda.